Initial plans for Michigan’s Interstate 696 started in the 1950’s, with construction of the highway starting in 1961. A subject of controversy was the central segment of the highway, due to the heavily saturated residential areas and large Orthodox Jewish community in Oak Park. The Orthodox Jews of Oak Park, requested that changes to the design be made that would minimize the impact of the highway to the pedestrian-dependent community. 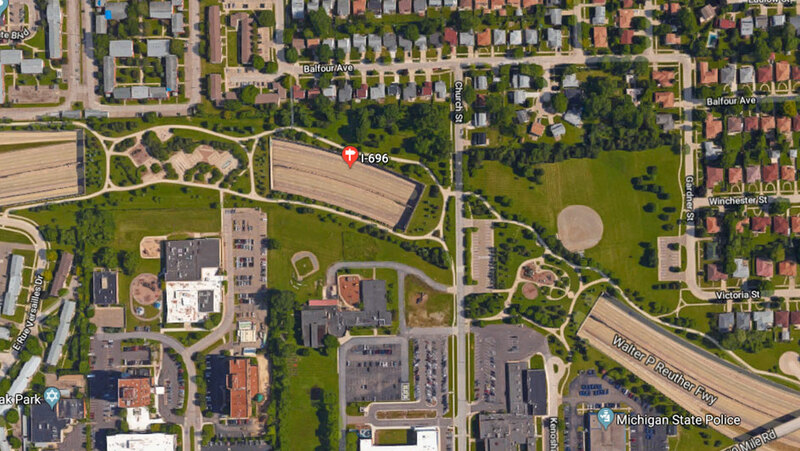 A series of landscaped plazas were incorporated into the design of the tunnels that I-696 passes. The landscapes plazas are 700-foot-wide bridges that cross the freeway, allowing the members of the Jewish community to walk to synagogues on the sabbath and holidays. Since the plaza bridges had landscaping installed, irrigation systems had also been installed to provide a watering system for the grass and plants on the bridge. Unfortunately, MDOT soon found themselves with a serious icicle problem in the tunnels below the plazas. The water from the irrigation system was leaking in between the concrete beams, that made up the construction of the bridge. As a result of the moisture, during cooler temperatures this seeping would create some very large, scary looking icicles in the tunnel below. A strong and long lasting solution was needed to seal the plaza bridge’s joints. URETEK was contacted for their high reputation in polymer “foam” repair solutions, as well as it’s successfully history of working with MDOT. 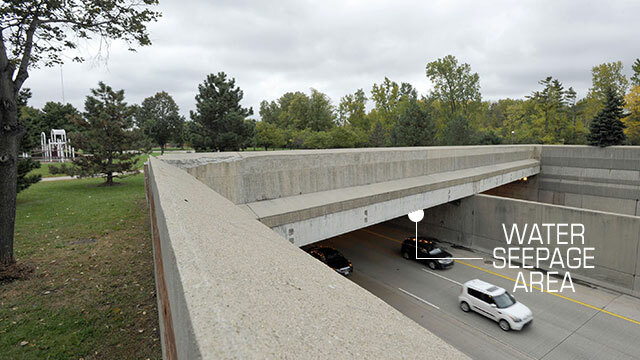 MDOT wanted to test URETEK’s high-density polymer resin injection and SPF (spray polyurethane foam) solutions on a section of one of the bridges. URETEK was to fill the voids and seal the bridge’s joints in between the beams on 4 of 5 joints. 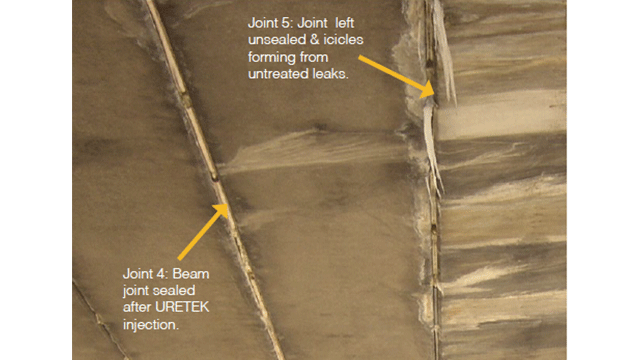 By leaving one joint open, MDOT would be able to determine if URETEK’s repair solutions would be a good fit for sealing all of the joints and solving their icicle issue. URETEK’s injection & SPF solutions utilize a strong lightweight polymer material that is highly suited for sealing areas with high moisture content. In order to minimize the impact on drivers, the test project was completed in the late evenings when it was more convenient for the highway to shut down temporarily. The URETEK technicians injected above and in between the concrete beams on 4 joints in a section that went over a pedestrian walkway. The 5th joint was left alone in order to test if URETEK’s solutions were successful. URETEK completed void filling and sealing the 4 joints successfully. Once weather temperatures cooled the test results showed that the polymer successfully sealed the joints and prevented the icicles from forming within. To see the results, using the image above, compare the sealed joint (Joint 4) that has no water seepage and icicles to the open joint (Joint 5) which shows icicles. UPDATE: Twelve years after the repair, the joints remain successfully sealed & intact.